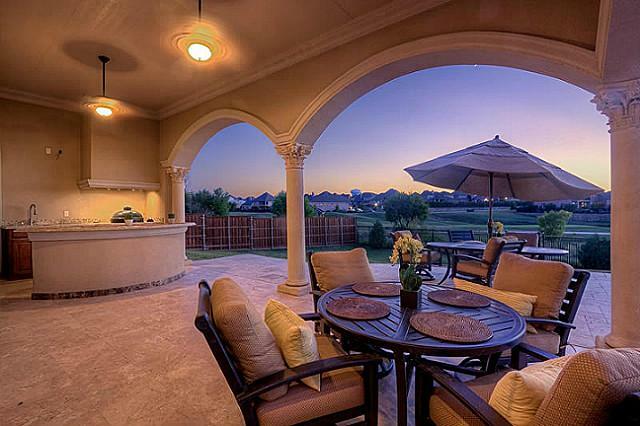 Former Dallas Cowboy and San Diego Chargers wide receiver, Patrick Crayton is selling his home in Lewisville TX for $1.899M. Crayton’s home is amazing, a true paradise on earth that is completely beautiful. The nearly 9,000 sq-ft Mediterranean style home sits on a completely private 0.59 acre lot that overlooks the golf course. As you walk in the foyer you’re greeted by 2 massive spiral staircases, marble flooring, huge pillared columns, and a grand piano that’s underneath an elegant chandelier. Crayton’s home also includes 6 bedrooms, 6 full bathrooms, 2 half baths, 6 car garage, cathedral ceilings, a huge Chef’s kitchen, large flowing living and dining rooms, an office, a game room, wet bar, theater room, workout rooms, and a 5 Star master suite with His and Hers vanities, soaking tub and fireplace. Like the inside, the outside of Crayton’s home is definitely not lacking in comfort and amenities. There’s a custom in-ground pool with fountain, spa, outdoor lounging and terraces, and outdoor kitchen, sports court, and of course, the golf course views. Listed by Victor Vo, Re/max Dfw Associates. Photos and content courtesy or Trulia. Everything’s bigger in Texas, and Crayton’s home is definite proof of that!